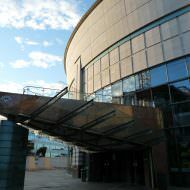 The original Belfast Waterfront building, built 1993 – 1997, comprises the main auditorium (2,200 seats), studio space (380 seats), meeting rooms and bar / restaurant. Plans for the Waterfront Hall developed from a decision of the Council dating back to 1978. At the time the Council decided to look at the potential of redeveloping a site at Mays Meadow to provide a new cultural venue for the city. Designs were considered during the 1980’s exploring the possibility of including a concert venue, theatre, ice rink, cinema and hotel. While investigating the potential redevelopment of Mays Meadow the design team recommended to the Council that Lanyon Place represented a better location for such a cultural development. The site was known as Laganbank at the time and was used as surface car parking adjacent to Oxford Street Bus Station. Belfast City Council vested the land required for the development whilst at the same time the Laganside Corporation was established in 1989 by Central Government. The Corporation intended to form an overall development strategy for the Laganside area including the council owned Laganbank site. Laganside Corporation agreed that a concert hall / conference centre would be best suited on the riverfront site to act as a stimulus for further development along the Lagan. The Council and Laganside Corporation agreed that the Council would develop the soon to be Waterfront Hall and the Corporation would be responsible for the rest of the 14 acre Lanyon Place site. 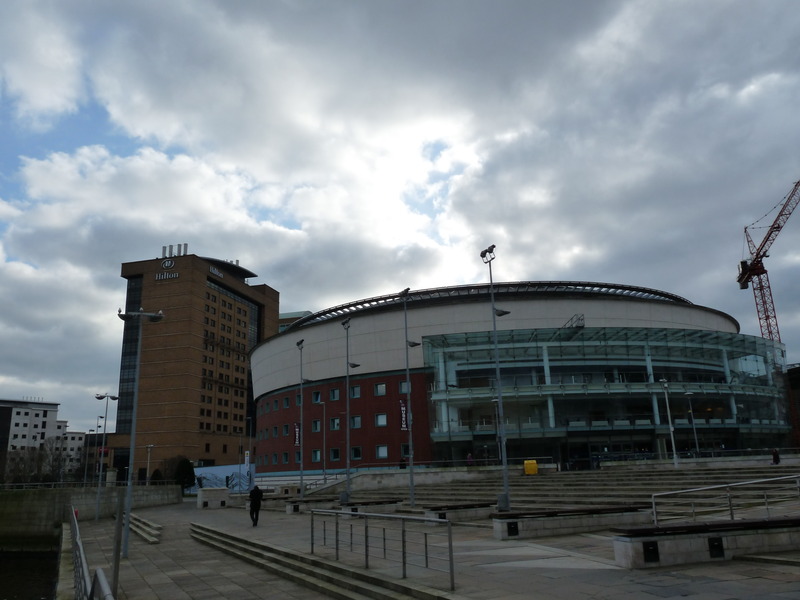 In October 1991 work began on the design of the Waterfront Hall by the same design team which was appointed back in 1978 to look at possibilities for the Mays Meadow site. The Council wished to have construction underway by summer 2003 and a maximum limit was set on the cost of the scheme of £29.1m The EU contributed £4m, while the Department of the Environment provided £6m towards the project with Belfast City Council making up the difference. 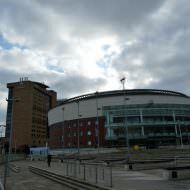 The design team had one year to prepare for construction despite many complexities including the unusual consideration of helicopter noise impacting upon the concert venue. The security situation in Northern Ireland at the time meant that as well as the venue being under the flight path for Belfast City Airport, there was also a high level of helicopter activity around the city. 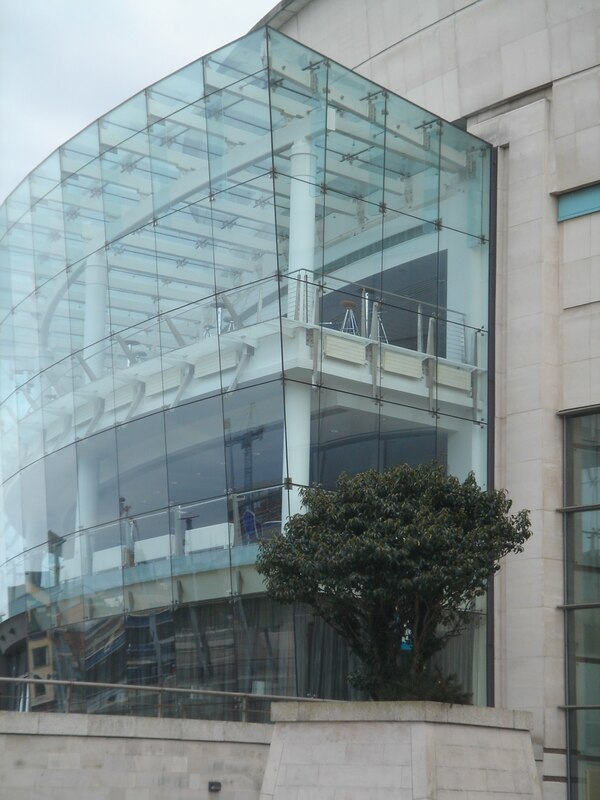 The team therefore concluded that a concrete roof was essential for the building, and to further ensure the auditoriums acoustics were not compromised, they proposed that the main plant room for the building be structurally separate. Gilbert Ash submitted the lowest tender and commenced work as the main contractor in May 1993. 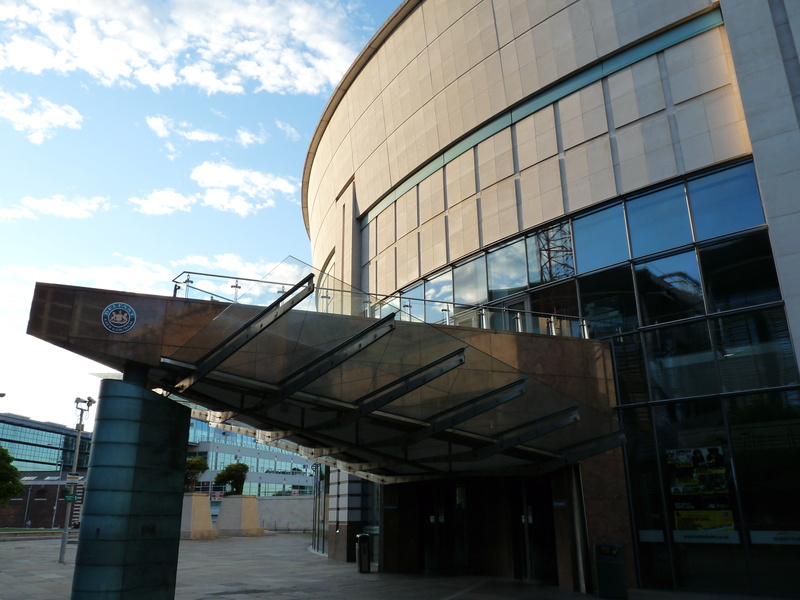 During 1993 the Waterfront Hall project was nearly axed altogether as the newly elected Council considered the cost of abandoning the development entirely. However, when the study revealed that the cost could amount to £19.5m the Council dropped proposals to potentially scrap the building and construction continued. Despite most of the structure being constructed from concrete, the Minor Hall was changed from a concrete structure to a steel frame structure during the build process. This design change enabled early completion of the plant room above the Hall which would allow for mechanical and electrical elements of the project to proceed much quicker. Steel girders were selected to span the roof of the Hall and support the concrete ceiling and the plant room above the ceiling. The roof was constructed during the summer in 1995 and complete in October 1995. The steelwork for the roof was delivered by Fisher Engineering to a temporary shed at Harland & Wolff were the components were fitted together as much as possible before being transported to the site for installation. 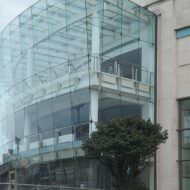 Construction was completed in January 1997 with the first performance in the same month on 17th January 1997. An official opening ceremony took place in May 1997 in which the Prince of Wales officially opened the building. A £30m extension was constructed between 2014 – 2016; for more information on the Belfast Waterfront extension please click here.